U.S. M1 Garand rifle solid resin [R-1291] - $312.50 : Metalcraft by Blair - military gifts and memoribilia. This is a full size U.S. M1 Garand rifle. 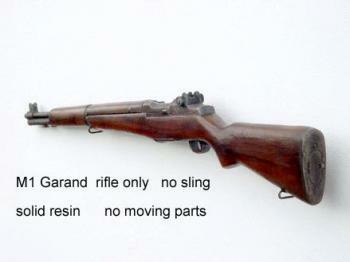 Rifle is made of solid resin material and has no moving parts. Designed for rough display or useage as in drill teams or re-enactors. Many of our guns are also available in other forms such as airsoft BB firing . Be sure you compare the items and your design needs before purchaseing. We have available several other styles of guns for your shopping pleasure. Be aware that like looking guns may not cost the same due to many external as well as internal factors, that make them different. Almost all guns can be mounted on some type of display -- depending upon your desires. If a mounting is going to be desired you will need to allow several weeks for delivery.